Exit the M4 at junction 33 and follow the A4232, signposted Barry / Airport / Cardiff West. At the A48 junction roundabout, take the third exit which is signposted A4050 Barry / Cardiff Airport. At the next five roundabouts, carry on following signs for A4050 Barry / Cardiff Airport. At the sixth roundabout take the second exit, still following signs for A4050 Barry / Cardiff Airport. When you get to the seventh roundabout, take the second exit (A4226), and at the eighth adjacent to the petrol station, take the second exit signposted A4226. When you reach the ninth roundabout, take the first exit signposted Cardiff Airport. The entrance to the car park is approximately 200 meters on the right hand side. The postcode for sat nav systems is CF62 3BT. When you arrive at the car park, pull up to the entry barrier where this will lift automatically and proceed to the parking lanes that are directly in front of you. Please remain in your car and wait for one of our customer service assistant to greet you and give you a parking ticket. Keep this safe as you’ll need it to leave the car park. Please make sure you have your booking confirmation when you arrive, the car park staff will then direct you into the parking area on the gravel patch. 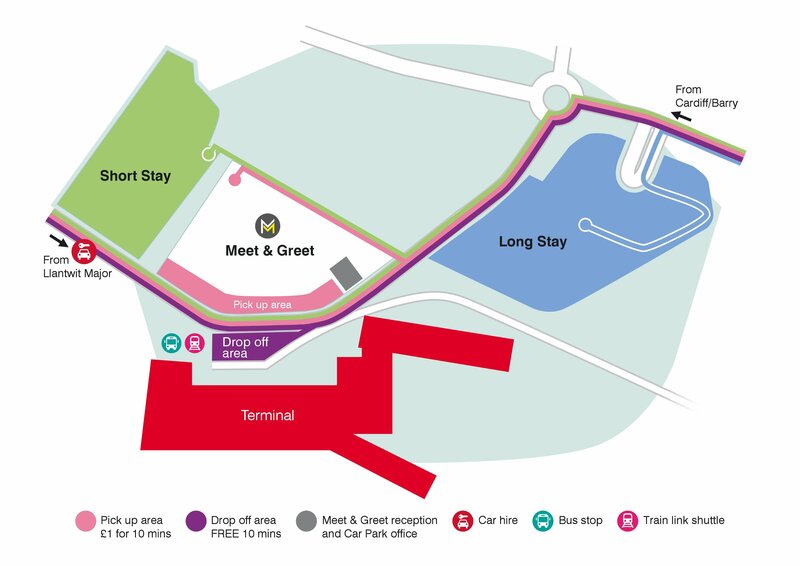 When you get back, simply exit the Arrivals Hall, head to the red bus stop at the front of the terminal and just catch the free transfer bus to the Offsite car park. It’s a good idea to have your booking to hand. When you’re ready to leave, simply drive to the automatic exit barrier with your booking confirmation and ticket and one of our team members will greet you before you leave, all that’s left to do is drive home. Cardiff Airport Offsite parking cannot accept bookings for minibuses, high-sided vehicles, mobile homes, Lorries, caravans or trailers, even if multiple spaces are booked. The car park is fenced off, floodlit and manned 24 hrs. Our staff also patrol this area regularly. Even though these measures are in place please keep valuables hidden or take them with you.